What gorgeous weather for early Spring! 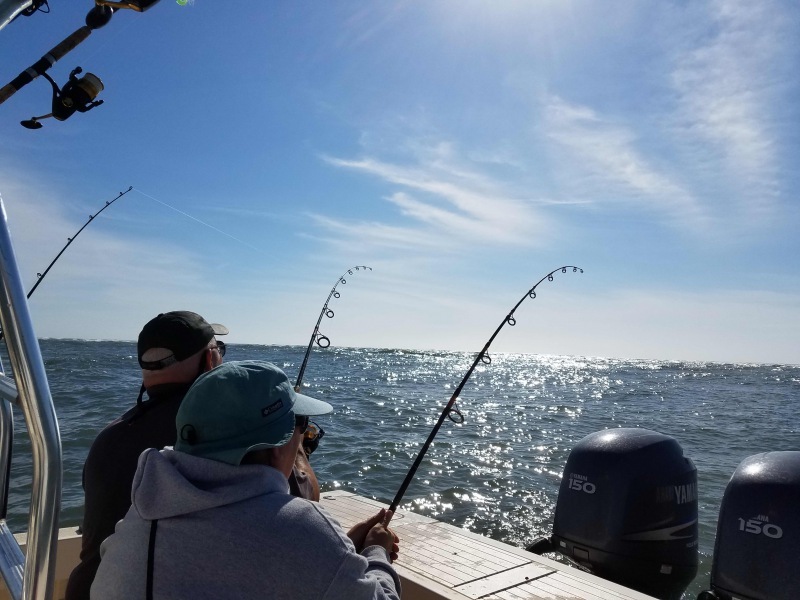 We had one group of young anglers who ventured out into the Pamlico Sound this morning for some inshore fishing. 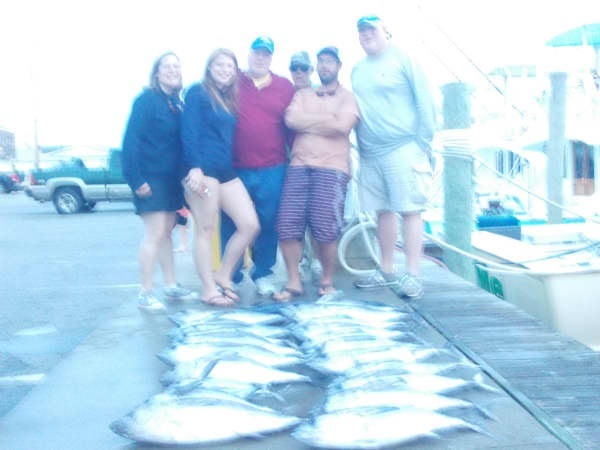 Besides lots of smiles, they returned with a nice catch of Bluefish. 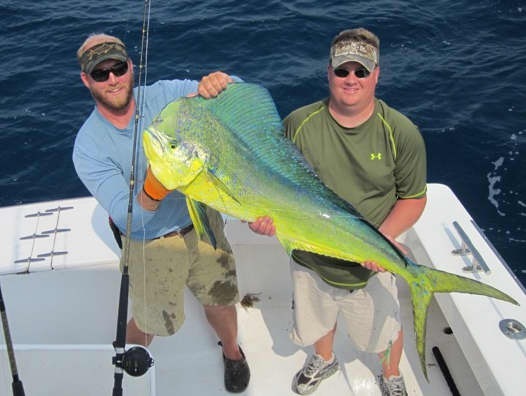 We offer inshore, near shore, or offshore fishing excursions. Call us at 800-676-4939 to book your trip! Another beautiful day with temperatures in the 70's! Vacationers are taking advantage of the summer-like weather and enjoying some time on the water. 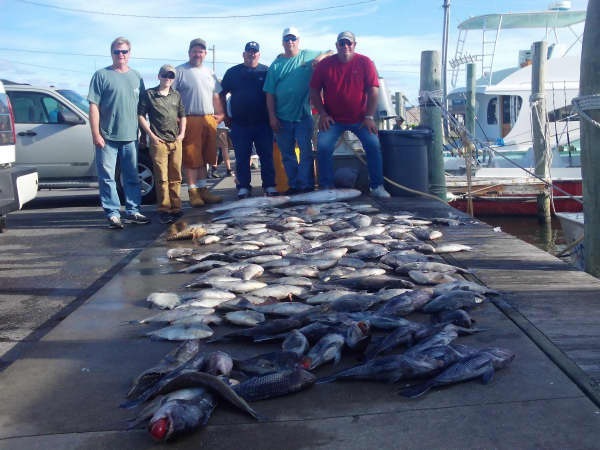 Inshore anglers had a great day catching limits of Puppy Drum. 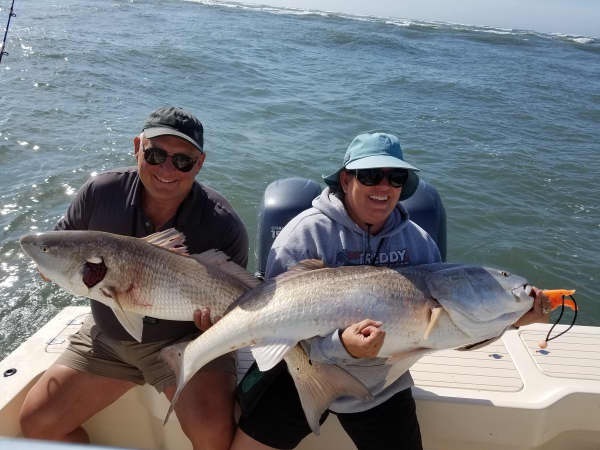 One inshore boat ventured near shore and experienced a great catch of Bluefish and Red Drum, along with lots of Shark action thrown in! 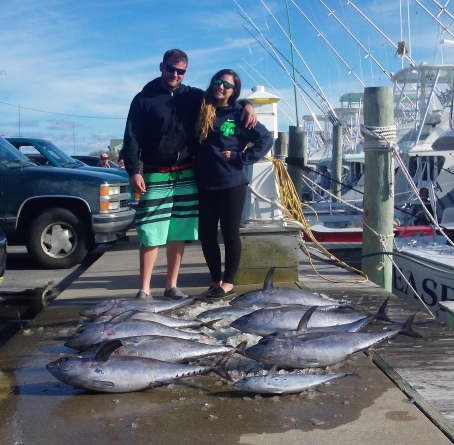 Two offshore boats returned early today with boxes full of Blackfin Tuna. 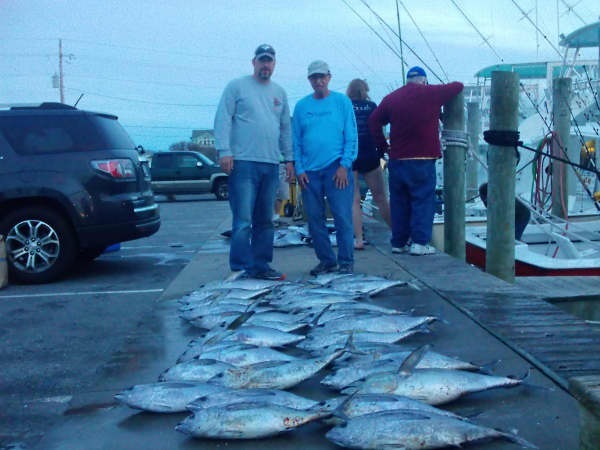 Several others stayed out the full day and returned with excellent catches of Blackfin Tuna, a few Dolphin, and a Wahoo. Bottom fish included Black Sea Bass and Amberjack. 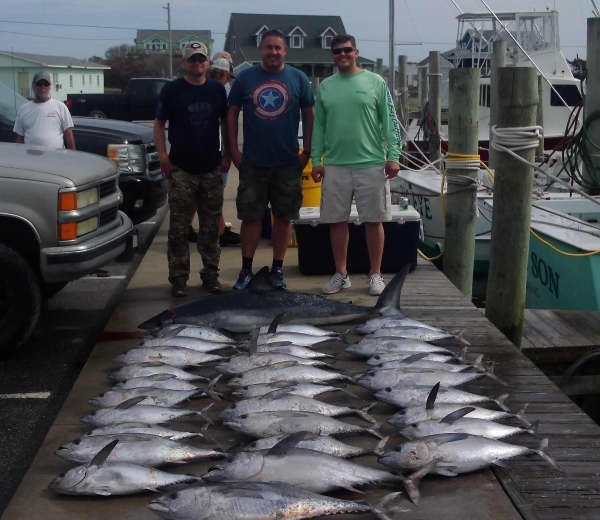 Looks like fishing is getting better all along the Outer Banks - don't miss the boat - Call 800-676-4939 and book your fishing adventure today! 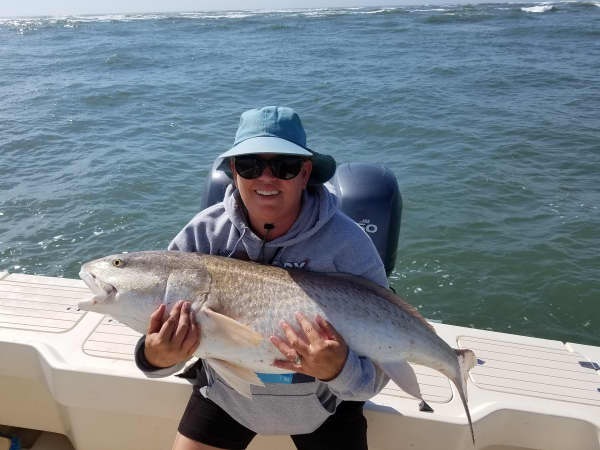 Sylvia Heagy of Kleinfeltersville, PA: 44" Red Drum release on Adventure. 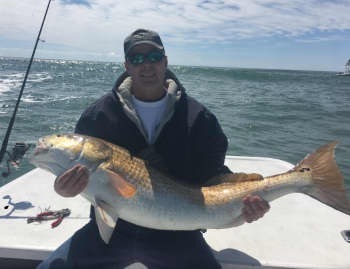 Douglas Heagy of Kleinfeltersville, PA: 41" Red Drum release on Adventure. 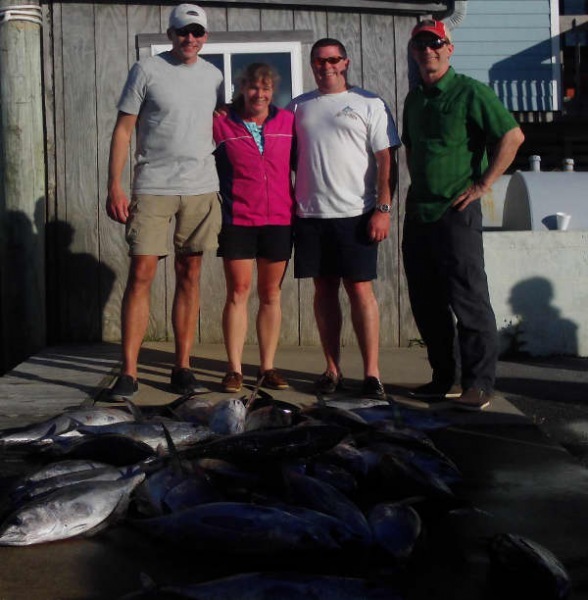 Thomas Lacerte of Collegeville, PA : 23lb Blackfin Tuna on Release. The calendar says summer doesn't start until June 21st but it sure felt like early summer here today. Lots of people coming onto the island on vacation, beautiful sunny skies with light winds and temps in the 70's. 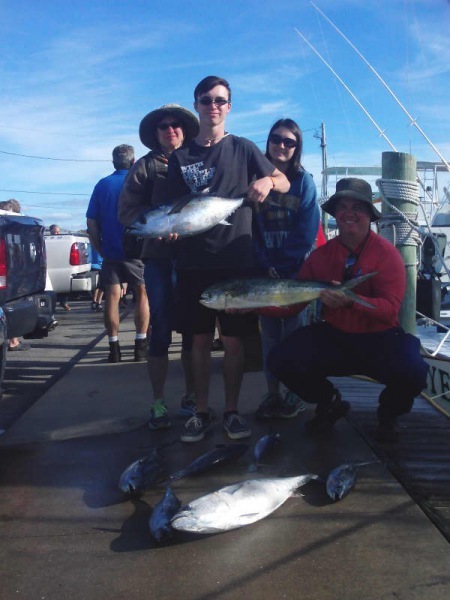 Several boats out fishing catching Blackfin Tuna, Triggerfish and Grouper offshore and Sheepshead, Sea Bass and Red Drum inshore. 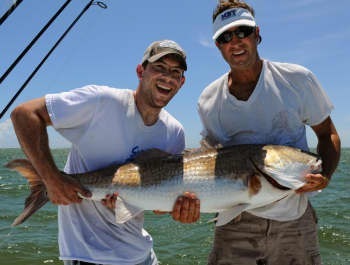 Lots of Red Drum being released for being too big to keep, but still a blast to pull in! Tightline: Armando Alejo of Tamarac, FL 56"
Adventure: Edward Hazlett of Norfolk, VA 50" 48". Konstantin Hazlett of Norfolk, Va 46". Matthew Momtsios of Norfolk, Va 47"
Tradition: Davis Gooding of Sandston, VA 47". Jason Gordon of Aylett, Va 46". Allison Brubaker of Chester, VA 45". Christi Brubaker of Chester, VA 46". Lindsey Brubaker of Chester, VA 42". Sound Bound: Jerry Promley of Ludington, MI 50". David Graham of Ludington, MI 2 @50" each. Good Times: Owen Little of Frisco, NC 5lbs. Adrianne Jackson of Frisco, NC 5lbs. Release: Stephen Cooper of VA Beach, VA 23lbs, 21lbs. Jacob Cooper of VA Beach, VA 24lbs, 21lbs, 27lbs. Jason Cooper of VA Beach, VA 24lbs. 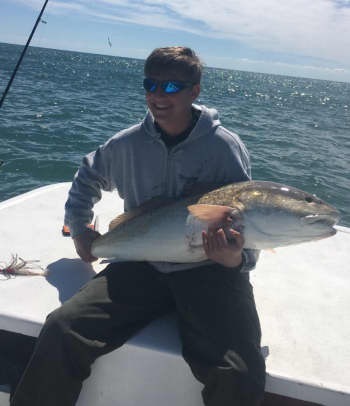 Inshore boats caught Bluefish, Blow Toads and big Red Drum releases. 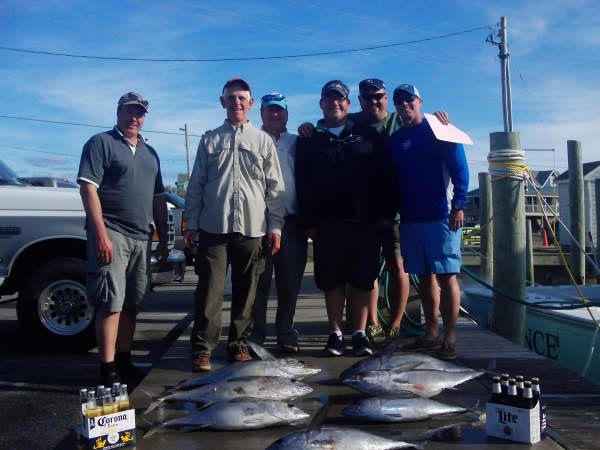 Today's charters had good weather and good fishing! 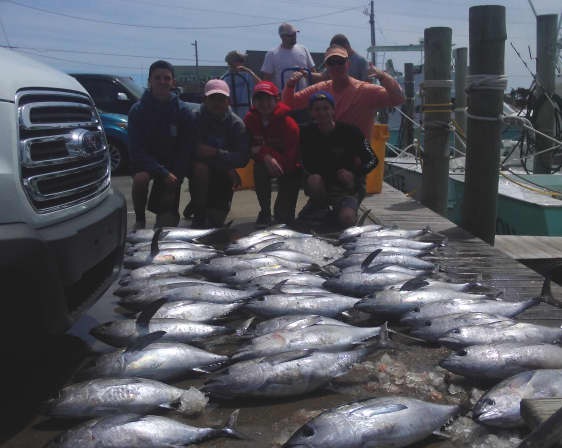 Offshore boats returned with excellent catches of big Blackfin Tuna and a few Gaffer Dolphin. 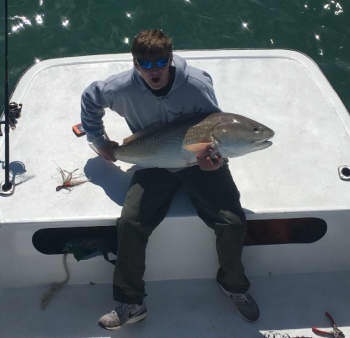 Inshore anglers caught some Bluefish and released a few Red Drum. 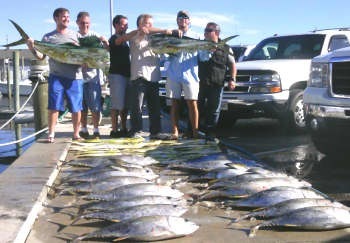 Looking for anglers to fill an offshore make up trip this week. Call 800-676-4939 for more information! The wind calmed down quite a bit today and abundant sunshine helped to warm things up a little. One boat fished offshore. 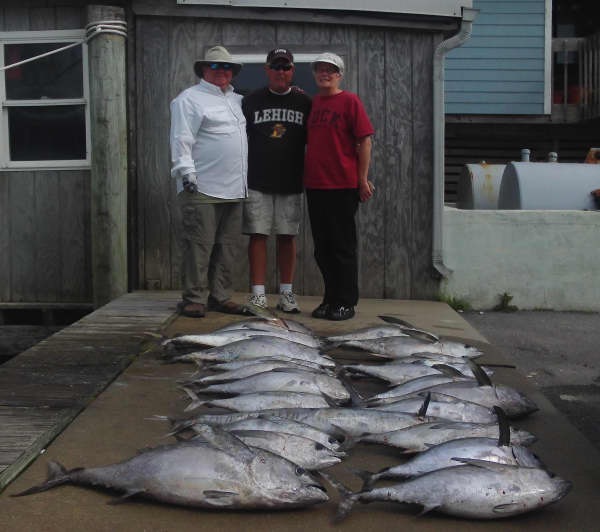 They reported a lot of current which affected fishing conditions. A few gaffer Dolphin were caught. 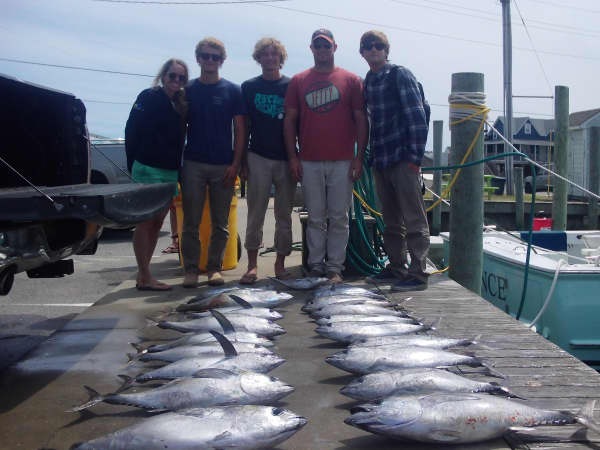 Amberjack were biting along with good bites from big Bluefish. 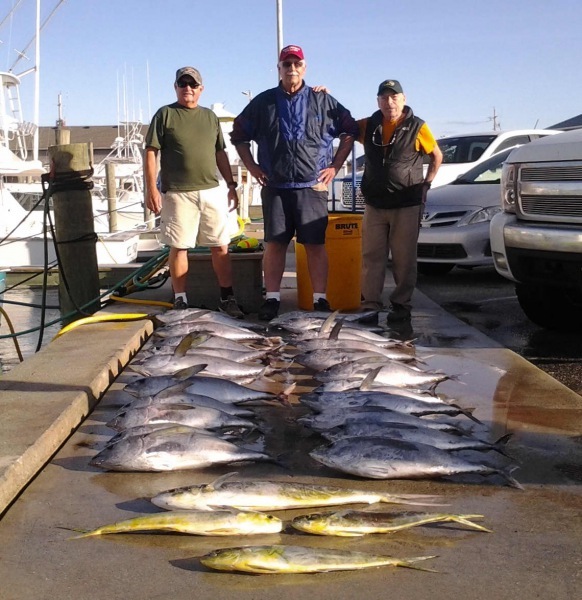 Several charters are planning to fish tomorrow - come on down to the dock between 4-5p.m. to see what they bring in! Matthew Eller of Hampton, VA: 16 lb. 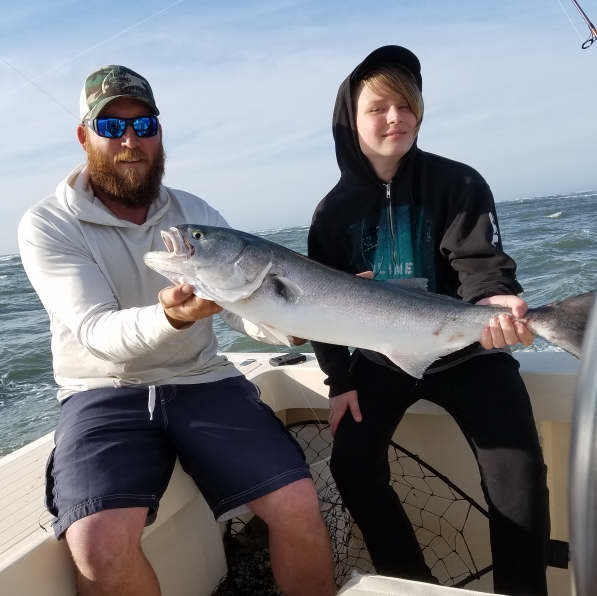 Bluefish on Good Times. Winds switched to the northwest today with gusts up to 40 mph. The air turned much cooler with temperatures forecast for the 40's tonight. There are some charters on the books for this weekend - we'll have to wait to see what ocean conditions prevail. Blowing a gale from the southwest - needless to say no one fished today. Looking to get some charters out this weekend. A couple of boats headed offshore today with their parties hoping to get a day in before the wind picked up again. 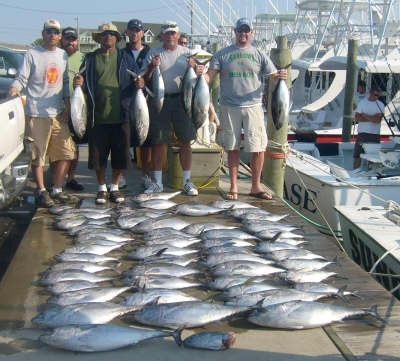 They report good catches of both Yellowfin and Blackfin Tuna along with a scattered Wahoo and Mako Shark. 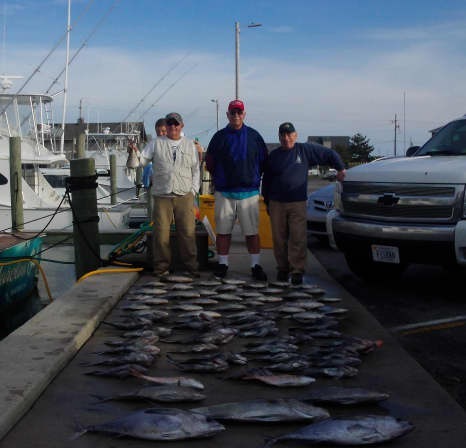 So all in all fishing out of Hatteras Harbor was pretty good today. Only one boat out today fishing inshore they reported some really large Bluefish and Red Drum. So many great new items in the store right now! Stop by and see what we have going on and let us get you out on the water!